The new baby orca swims alongside its presumed mother. A pod of endangered killer whales that swims off the coast of Washington state welcomed its first newborn in more than two years. On Dec. 30, Ken Balcomb, a scientist at the Center for Whale Research, noticed the newborn orca while monitoring a pod, dubbed J-pod, which hangs around Puget Sound, a large Pacific Ocean inlet. The baby killer whale is likely about seven or eight days old now. "The loss of J-32 was a disturbing setback," Brad Hanson, a wildlife biologist with the National Oceanic and Atmospheric Administration (NOAA), told Live Science. "We lost a lot of reproductive potential." But the new baby whale, named J-50, is a good sign, Hanson added. Balcomb is still unsure who the mother of the new whale is. It might be a younger female named J-36 or the more seasoned 43-year-old whale named J-16 who has had three other surviving calves. However, J-16's last calf died within a month in December 2011, according to Balcomb. The death was not unusual, since about 35 to 45 percent of newborn orcas don't make it past their first year, according to NOAA. If J-50 survives, it will be the first successful newborn in the Puget Sound population in about two and a half years. Since the birth of the new whale, the pod has stayed in the Strait of Georgia, an area closer to Vancouver that is notorious for bad weather and difficult for scientists to reach, Hanson said. One of the whales in J-pod has a satellite transmitter attached to it, so once the pod moves on to friendlier waters, scientists will check on the new whale and determine who its mother is. 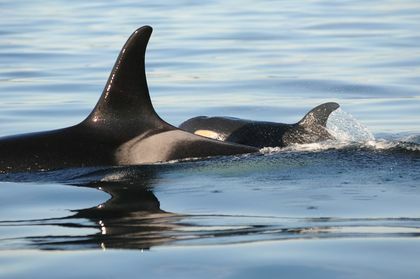 The birth of J-50 makes it the 78th orca in the population off the coast of Washington state and Canada. Killer whales are widely distributed around the world, but this particular group of killer whales is considered an endangered species in the United States and Canada. Part of the problem is that this group was targeted for captive display, Hanson said. During the late 1960s and early 1970s, at least 40 of the whales (over half of the population) were taken for captive display. The population rebounded to almost 100 whales in the 1990s, but by the early 2000s, it saw a 20 percent decline. In 2005, the United States listed the group as endangered. The exact cause of the decline is still unknown, Hanson said. However, one likely factor is the dwindling supply of Chinook salmon, the largest type of Pacific salmon and one of the orcas' primary food sources. "I think we must restore abundant healthy prey resources ASAP if these whales are to have any chance of avoiding extinction," Balcomb wrote in his necropsy report of J-32. "The critical point for their recovery may already have passed."